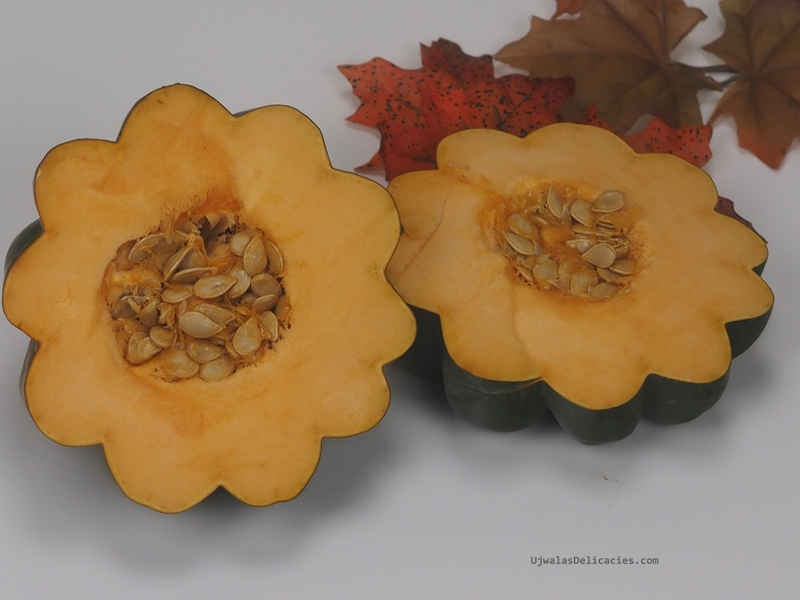 Acorn squash is aromatic and sweet with a light nuttiness that is enhanced by roasting. Look for squash with a slight patch of orange which indicates maturity. Too much orange means it is overripe unless it is the golden variety. One of the first published recipes for pumpkin pie (Pompkin Pudding) was in Amelia Simmons’ 1796 cookbook, American cookery. This the first cookbook to be written by an American and published in the United States. An average pumpkin weighs 10-20 pounds, though the Atlantic Giant variety can weigh 400-600 pounds, enough for perhaps 300 pies! 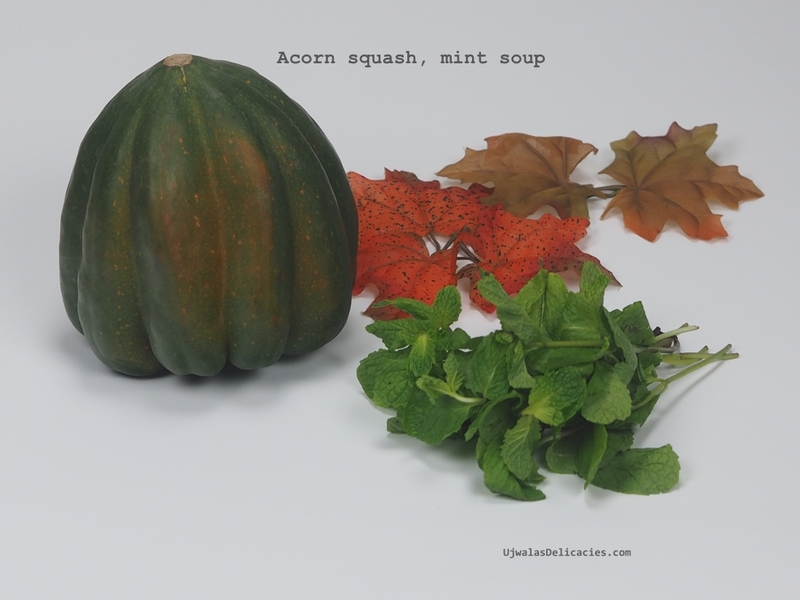 Presidents Washington and Jefferson grew squash in their gardens. Acorn squash has a glycemic load of 8, which means that a single serving does not raise blood sugar levels significantly. Foods with glycemic load scores lower than 10 are considered appropriate for a diabetic diet or a low-glycemic diet for individuals trying to lose weight. Cut squash into half. 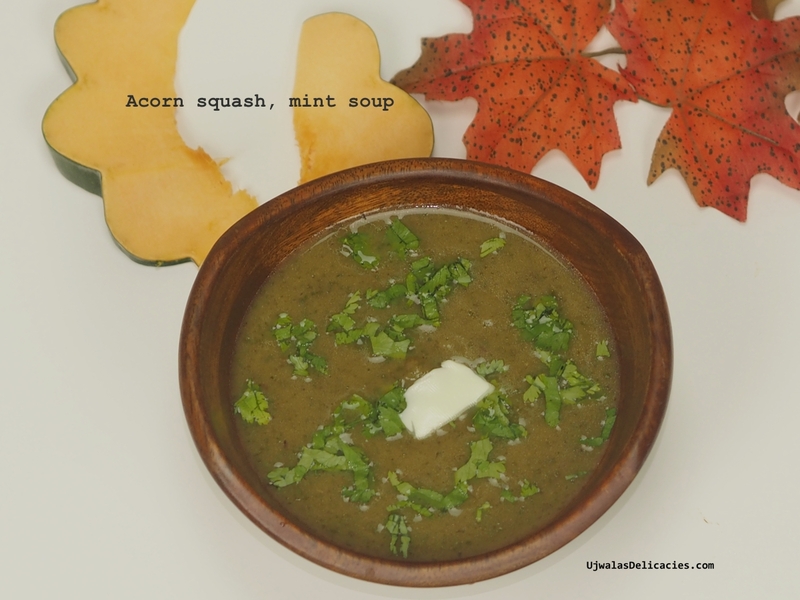 Cook acorn squash in pressure cooker till 2 whistles. If you don't have pressure cooker, boil water in stockpot. Submerge acorn. Cook till soft. After cooking, remove and discard skin. Skin comes off quickly. While it cooks, heat oil in a pot. Add cumin. Fry for 40 seconds. Add chillies, onion and mint. Fry for 5 minutes. Stir every minute. Add ghee to a pot.